Aguinis, Herman; Shapiro, Debra L.; Antonacopoulou, Elena P.;. Scholarly Impact: A Pluralist Conceptualization ACADEMY OF MANAGEMENT LEARNING & EDUCATION , 2014. Aliaga, Francisco M.; Gutierrez-Braojos, Calixto; Fernandez-Cano, Antonio;. Research journals in education: SWOT Analysis RIE-REVISTA DE INVESTIGACION EDUCATIVA , 2018. Alperin; Juan Pablo;. Geographic variation in social media metrics: an analysis of Latin American journal articles ASLIB JOURNAL OF INFORMATION MANAGEMENT , 2015. Alvarez-Bornstein, Belen; Montesi, Michela;. Researchers' communication on Twitter. A virtual ethnography in the area of information science REVISTA ESPANOLA DE DOCUMENTACION CIENTIFICA , 2016. Amor Perez-Rodriguez, M.; Garcia-Ruiz, Rosa; Aguaded, Ignacio;. Comunicar: quality, visibility and impact REVISTA ESPANOLA DE PEDAGOGIA , 2018. Barnes; Cameron;. The Use of Altmetrics as a Tool for Measuring Research Impact AUSTRALIAN ACADEMIC & RESEARCH LIBRARIES , 2015. Bornmann; Lutz;. Alternative metrics in scientometrics: a meta-analysis of research into three altmetrics SCIENTOMETRICS , 2015. Bornmann; Lutz;. Do altmetrics point to the broader impact of research? An overview of benefits and disadvantages of altmetrics JOURNAL OF INFORMETRICS , 2014. Bornmann; Lutz;. Validity of altmetrics data for measuring societal impact: A study using data from Altmetric and F1000Prime JOURNAL OF INFORMETRICS , 2014. Butler, Joseph S.; Kaye, I. David; Sebastian, Arjun S.;. The Evolution of Current Research Impact Metrics From Bibliometrics to Altmetrics? CLINICAL SPINE SURGERY , 2017. Calva Cabrera, Ketty Daniela; Portilla, Idoia;. 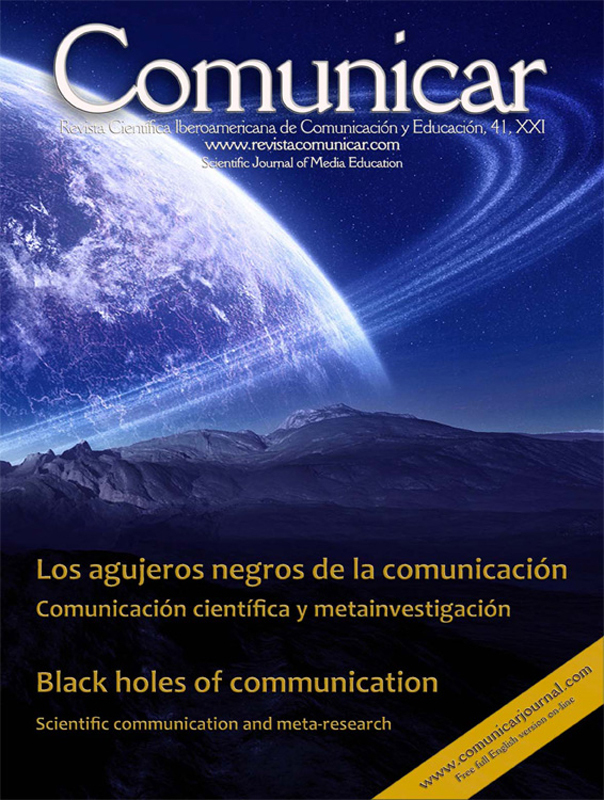 Communication professors of Ecuador in the Academic Scientific Networks ADCOMUNICA-REVISTA CIENTIFICA DE ESTRATEGIAS TENDENCIAS E INNOVACION EN COMMUNICACION , 2016. Campos, Francisco; Valencia, Andrea; Rocha, A;. Managing Academic Profiles on Scientific Social Networks NEW CONTRIBUTIONS IN INFORMATION SYSTEMS AND TECHNOLOGIES, VOL 1, PT 1 , 2015. Campos-Freire, Francisco; Ruas-Araujo, Jose;. The use of professional and scientific social networks: The case of three Galician universities PROFESIONAL DE LA INFORMACION , 2016. Cespedes Villegas, Alejandor; Peralta Gonzalez, Maria Josefa; Paz Enrique, Luis Ernesto;. Alternative indicators of Universidad Central CUADERNOS DE DOCUMENTACION MULTIMEDIA , 2017. Costas, Rodrigo; Perianes-Rodriguez, Antonio; Ruiz-Castillo, Javier;. On the quest for currencies of science Field ASLIB JOURNAL OF INFORMATION MANAGEMENT , 2017. Costas, Rodrigo; Zahedi, Zohreh; Wouters, Paul;. The thematic orientation of publications mentioned on social media Large-scale disciplinary comparison of social media metrics with citations ASLIB JOURNAL OF INFORMATION MANAGEMENT , 2015.
de Rosa, Annamaria Silvana; Chova, LG; Martinez, AL;. ARTICLE, BOOK FORMAT, OR BOTH? SHARED CRITERIA ADOPTED FOR THE DOUBLE DOCTORAL THESIS FORMAT AND LANGUAGE IN A EUROPEAN/INTERNATIONAL JOINT NETWORKED PhD PROGRAM INTED2016: 10TH INTERNATIONAL TECHNOLOGY, EDUCATION AND DEVELOPMENT CONFERENCE , 2016.
de Rosa, Annamaria Silvana; Chova, LG; Martinez, AL;. THE USE OF BIG-DATA AND META-DATA FROM THE SO.RE.COM. INTED2015: 9TH INTERNATIONAL TECHNOLOGY, EDUCATION AND DEVELOPMENT CONFERENCE , 2015.
de Rosa, Annamaria Silvana; Dryjanska, Laura; Bocci, Elena;. The Impact of the Impact of Meta-Data Mining From the SoReCom ENCYCLOPEDIA OF INFORMATION SCIENCE AND TECHNOLOGY, 4TH EDITION , 2018. De Silva, Pali U. K.; Vance, Candace K.; DeSilva, PUK;. Assessing the Societal Impact of Scientific Research SCIENTIFIC SCHOLARLY COMMUNICATION: THE CHANGING LANDSCAPE , 2017. Direito-Rebollal, Sabela; Campos-Freire, Francisco; Rocha, A;. Altmetrics A measure of scientific impact on social networks 2016 11TH IBERIAN CONFERENCE ON INFORMATION SYSTEMS AND TECHNOLOGIES (CISTI) , 2016. Duart, Josep M.; Mengual-Andres, Santiago;. 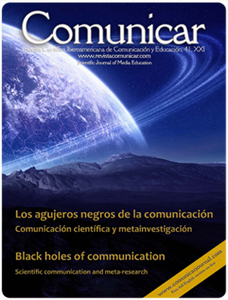 Impact of the Knowledge Society in the University and in Scientific Communication RELIEVE-REVISTA ELECTRONICA DE INVESTIGACION Y EVALUACION EDUCATIVA , 2014. Fonseca-Mora, M. C.; Aguaded, I.;. Scientific Journals as Platforms to Publish Research of Excellence in Education: Strategies to Attract Researchers RELIEVE-REVISTA ELECTRONICA DE INVESTIGACION Y EVALUACION EDUCATIVA , 2014. Garcia Aretio; Lorenzo;. Publish (almost exclusively) in high impact journals RIED-REVISTA IBEROAMERICANA DE EDUCACION A DISTANCIA , 2015. Haunschild, Robin; Bornmann, Lutz;. Normalization of Mendeley reader counts for impact assessment JOURNAL OF INFORMETRICS , 2016. Haustein, Stefanie; Sugimoto, Cassidy R.; Lariviere, Vincent;. Guest editorial: social media in scholarly communication ASLIB JOURNAL OF INFORMATION MANAGEMENT , 2015. Huang, Wenya; Wang, Peiling; Wu, Qiang;. A correlation comparison between Altmetric Attention Scores and citations for six PLOS journals PLOS ONE , 2018. Hughes, Hannah; Hughes, Andrew; Murphy, Colin G.;. The Use of Twitter by Trauma and Orthopaedic Surgery Journals: Twitter Activity, Impact Factor, and Alternative Metrics CUREUS , 2017. Kjellberg, Sara; Haider, Jutta; Sundin, Olof;. Researchers' use of social network sites: A scoping review LIBRARY & INFORMATION SCIENCE RESEARCH , 2016. Kligmann, Debora M.; Spengler, Gisela M.;. Historical analysis of a specialized scientific publication: past, present and future of the journal Arqueologia 25 years since its creation ARQUEOLOGIA , 2016. Liu, Yu; Huang, Zhen; Fang, Jing;. An Article Level Metric in the Context of Research Community WWW'14 COMPANION: PROCEEDINGS OF THE 23RD INTERNATIONAL CONFERENCE ON WORLD WIDE WEB , 2014. Luis Gonzalez-Valiente, Carlos; Pacheco-Mendoza, Josmel; Arencibia-Jorge, Ricardo;. A review of altmetrics as an emerging discipline for research evaluation LEARNED PUBLISHING , 2016. Maricato, Joao de Melo; Martins, Dalton Lopes;. Altmetrics: complexities, challenges and new forms of measurement and understanding of scientific communication in the social web BIBLIOS-REVISTA DE BIBLIOTECOLOGIA Y CIENCIAS DE LA INFORMACION , 2017. Maricato, Joao de Melo; Vilan Filho, Jayme Leiro;. The potential for Altmetrics to measure other types of impact in scientific production: academic and social impact dynamics in social media and networks INFORMATION RESEARCH-AN INTERNATIONAL ELECTRONIC JOURNAL , 2018. Melero; Remedios;. Altmetrics - a complement to conventional metrics BIOCHEMIA MEDICA , 2015. Montesi; Michela;. Science and society: a new challenge for information professionals IBERSID-REVISTA DE SISTEMAS DE INFORMACION Y DOCUMENTACION , 2017. Orduna-Malea, Enrique; Torres-Salinas, Daniel; Delgado Lopez-Cozar, Emilio;. Hyperlinks embedded in twitter as a proxy for total external in-links to international university websites JOURNAL OF THE ASSOCIATION FOR INFORMATION SCIENCE AND TECHNOLOGY , 2015. Orduna-Malea; Enrique;. The social web as a new communication medium and scientific evaluation REVISTA ESPANOLA DE DOCUMENTACION CIENTIFICA , 2016. Ringelhan, Stefanie; Wollersheim, Jutta; Welpe, Isabell M.;. I Like, I Cite? Do Facebook Likes Predict the Impact of Scientific Work? PLOS ONE , 2015. Robinson-Garcia, Nicolas; Torres-Salinas, Daniel; Zahedi, Zohreh;. NEW DATA, NEW POSSIBILITIES: EXPLORING THE INSIDES OF ALTMETRIC.COM PROFESIONAL DE LA INFORMACION , 2014. Romero-Frias, Esteban; Arroyo-Machado, Wenceslao;. POLICY LABS IN EUROPE: POLITICAL INNOVATION, STRUCTURE AND CONTENT ANALYSIS ON TWITTER PROFESIONAL DE LA INFORMACION , 2018. Romero-Frias, Esteban; Robinson-Garcia, Nicolas;. Social Labs in Universities: Innovation and impact in Medialab UGR COMUNICAR , 2017. Salatino; Maximiliano;. Beyond Indexing: Social Sciences Publication Circuits in Argentina and Brazil DADOS-REVISTA DE CIENCIAS SOCIAIS , 2018. Sanchez-Carrion, Mario; Coronel-Romero, Edison; Labanda-Jaramillo, Milton;. Computer system for the management and scientific divulgation of the 2018 13TH IBERIAN CONFERENCE ON INFORMATION SYSTEMS AND TECHNOLOGIES (CISTI) , 2018. Scotti, Valeria; De Silvestri, Annalisa; Scudeller, Luigia;. Novel bibliometric scores for evaluating research quality and output: a correlation study with established indexes INTERNATIONAL JOURNAL OF BIOLOGICAL MARKERS , 2016. Sugimoto, Cassidy R.; Work, Sam; Lariviere, Vincent;. Scholarly Use of Social Media and Altmetrics: A Review of the Literature JOURNAL OF THE ASSOCIATION FOR INFORMATION SCIENCE AND TECHNOLOGY , 2017. Taberner; R.;. Altmetrics: Beyond the Impact Factor ACTAS DERMO-SIFILIOGRAFICAS , 2018. Thelwall, Mike; Maflahi, Nabeil;. Are Scholarly Articles Disproportionately Read in Their Own Country? An Analysis of Mendeley Readers JOURNAL OF THE ASSOCIATION FOR INFORMATION SCIENCE AND TECHNOLOGY , 2015. Torres-Salinas, Daniel; Castillo-Valdivieso, Pedro-Angel; Perez-Luque, Alvaro;. Altmetrics at institutional level: Visibility on the web of the scientific production of Spanish universities from Altmetric.com PROFESIONAL DE LA INFORMACION , 2018. Torres-Salinas, Daniel; Jimenez-Contreras, Evaristo; Robinson-Garcia, Nicolas;. Trends in science mapping: Co-use of scientific literatures as evidence of researchers' interests PROFESIONAL DE LA INFORMACION , 2014. Torres-Salinas, Daniel; Milanes-Guisado, Yusnelkis;. Presence on social networks and altmetrics of authors frequently published in the journal EI profesional de la informacion PROFESIONAL DE LA INFORMACION , 2014. Torres-Salinas, Daniel; Robinson-Garcia, Nicolas; Jimenez-Contreras, Evaristo;. Can we use altmetrics at the institutional level? A case study analysing the coverage by research areas of four Spanish universities 21ST INTERNATIONAL CONFERENCE ON SCIENCE AND TECHNOLOGY INDICATORS (STI 2016) , 2016. Travieso Rodriguez, Crispulo; de Araujo, Ronaldo Ferreira;. Altmetrics and citation indicators applied to scientific production in ScienceOpen: descriptive analysis for Brazil, Spain and Portugal BIBLIOTECAS-ANALES DE INVESTIGACION , 2018. Vanti, Nadia; Sanz-Casado, Elias;. Altmetrics: Social media metrics for a more democratic science TRANSINFORMACAO , 2016. Villena Alarcon; Eduardo;. PRODUCTION OF KNOWLEDGE IN DOCTORAL THESES ON FASHION IN SPAIN PRISMA SOCIAL , 2019. Wang, Xianwen; Fang, Zhichao; Guo, Xinhui;. Tracking the digital footprints to scholarly articles from social media SCIENTOMETRICS , 2016. Yang, Sharon Q.; Dawson, Patricia H.; Kataria, S;. Altmetrics and Their Potential as an Assessment Tool for Digital Libraries IEEE 5TH INTERNATIONAL SYMPOSIUM ON EMERGING TRENDS AND TECHNOLOGIES IN LIBRARIES AND INFORMATION SERVICES (ETTLIS 2018) , 2018. Zahedi, Zohreh; Costas, Rodrigo; Wouters, Paul;. How well developed are altmetrics? A cross-disciplinary analysis of the presence of 'alternative metrics' in scientific publications SCIENTOMETRICS , 2014. Aliaga, F.M., Gutiérrez-Braojos, C., Fernández-Cano, A.. Research journals in education: SWOT analysis | Las revistas de investigación en educación: Análisis DAFO), Revista de Investigacion Educativa, 2018. Bornmann, L., Haunschild, R., Adams, J.. Do altmetrics assess societal impact in a comparable way to case studies? An empirical test of the convergent validity of altmetrics based on data from the UK research excellence framework (REF)), Journal of Informetrics, 2019. Butler, J.S., Kaye, I.D., Sebastian, A.S., Wagner, S.C., Morrissey, P.B., Schroeder, G.D., Kepler, C.K., Vaccaro, A.R.. The evolution of current research impact metrics), Clinical Spine Surgery, 2017. Costas, R., Perianes-Rodríguez, A., Ruiz-Castillo, J.. On the quest for currencies of science: Field exchange rates for citations and Mendeley readership), Aslib Journal of Information Management, 2017. De Melo Maricato, J., Filho, J.L.V.. The potential for altmetrics to measure other types of impact in scientific production: Academic and social impact dynamics in social media and networks), Information Research, 2018. González-Fernández-Villavicencio, N., Moya-Orozco, V.M.. Are altmetrics-traditional systems correlations affected by the journals' social media marketing plan? : The journal comunicar | ¿las correlaciones altmétricas/métricas tradicionales se ven afectadas por los planes de marketing en medios sociales de las re), Anales de Documentacion, 2018. González-Valiente, C.L., Pacheco-Mendoza, J., Arencibia-Jorge, R.. A review of altmetrics as an emerging discipline for research evaluation), Learned Publishing, 2016. Huang, W., Wang, P., Wu, Q.. A correlation comparison between Altmetric Attention Scores and citations for six PLOS journals), PLoS ONE, 2018. Montesi, M.. Science and society: A new challenge for information professionals | Ciencia y sociedad: Un nuevo reto para los profesionales de la documentación), Ibersid, 2017. Niklander, S.. Visibilized thematics via Twitter by the Government of Chile: Two cases of corruption | Temáticas Visibilizadas VÍa Twitter por el Gobierno de Chile: Dos Casos de Corrupción), Iberian Conference on Information Systems and Technologies, CISTI, 2016. Pérez-Rodríguez, M.A., García-Ruiz, R., Aguaded, I.. Comunicar: Quality, visibility, and impact), Revista Espanola de Pedagogia, 2018. Romero-Frías, E., Arroyo-Machado, W.. Policy labs in Europe: Political innovation, structure and content analysis on twitter | Policy labs en Europa: Innovación política, estructura y análisis de contenido en twitter), Profesional de la Informacion, 2018. Romero-Frías, E., Robinson-garcía, N.. Social labs in universities: Innovation and impact in medialab UGR), Comunicar, 2017. Sanchez-Carrion, M., Coronel-Romero, E., Labanda-Jaramillo, M., Chamba-Eras, L., Guaman-Quinche, R., Roman-Sanchez, M.. Computer system for the management and scientific divulgation of the 'Universidad Nacional de Loja' | Sistema informático para la gestión y publicación de la producción científica de la Universidad Nacional de Loja), Iberian Conference on Information Systems and Technologies, CISTI, 2018. Scotti, V., De Silvestri, A., Scudeller, L., Abele, P., Topuz, F., Curti, M.. Novel bibliometric scores for evaluating research quality and output: A correlation study with established indexes), International Journal of Biological Markers, 2017. Sugimoto, C.R., Work, S., Larivière, V., Haustein, S.. Scholarly use of social media and altmetrics: A review of the literature), Journal of the Association for Information Science and Technology, 2017. Torres-Salinas, D., Castillo-Valdivieso, P.-A., Pérez-Luque, Á., Romero-Frías, E.. Altmetrics at institutional level: Visibility on the web of the scientific production of Spanish universities from Altmetric.com | Altmétricas a nivel institucional: Visibilidad en la web de la producción científica de las universidades españolas a partir), Profesional de la Informacion, 2018. Wang, X., Fang, Z., Guo, X.. Tracking the digital footprints to scholarly articles from social media), Scientometrics, 2016. Yang, S.Q., Dawson, P.H.. Altmetrics and Their Potential as an Assessment Tool for Digital Libraries), IEEE 5th International Symposium on Emerging Trends and Technologies in Libraries and Information Services, ETTLIS 2018, 2018. Zou, D., Han, Y.. An Altmetrics study of TOP100 samples in 2016), ISSI 2017 - 16th International Conference on Scientometrics and Informetrics, Conference Proceedings, 2017. I Like, I Cite? Do Facebook Likes Predict the Impact of Scientific Work?